The Babbish trail is located in the Sunlight Mountain Resort Nordic Area near Glenwood Springs, Colorado. 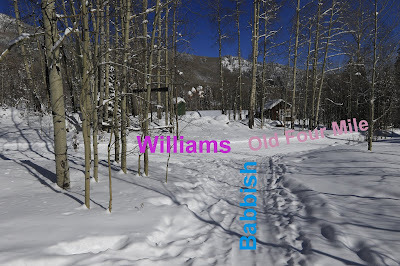 It begins off of the Williams trail where it descends an ungroomed route through the heart of Babbish Gulch until it reaches the Old Four Mile Road where the Old Four Mile trail transitions into the Williams trail. Near the upper end of the Babbish trail there is an unmarked spur that unites it with the Dipsy Doodle trail and near the lower end it has a junction with the Glades trail. 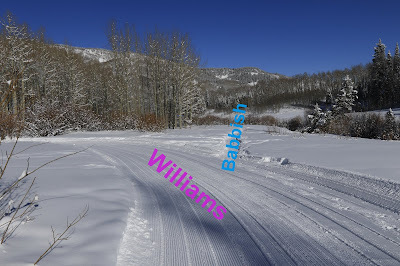 The Babbish trail branches off of the Williams trail near the 1 mile point from the Upper trailhead that is along Forest Road #300. 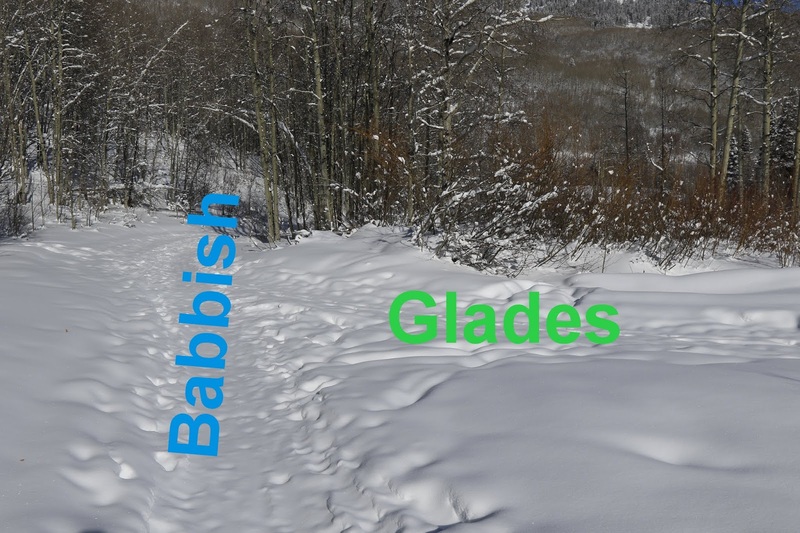 There is also an upper section of the Babbish trail that begins off of the Upper Meadow Loop on the map that is included at the end of this post. It ends up reconnecting with the Williams trail about a quarter mile from where the lower section of the Babbish trail begins in this photo. There is a trail sign for the Babbish trail on an aspen tree less than 100 feet down the trail. The trail starts out in an open meadowy area as it travels down Babbish Gulch on the west side of the creek. The normal route for the Babbish trail stays on the same side of the creek all the way down the gulch. There are alternate routes to follow in several places where people have chosen different ways to get to the same place. The Dipsy Doodle trail runs close to the ridge on the east side of Babbish Gulch before the Babbish trail leaves the meadows. 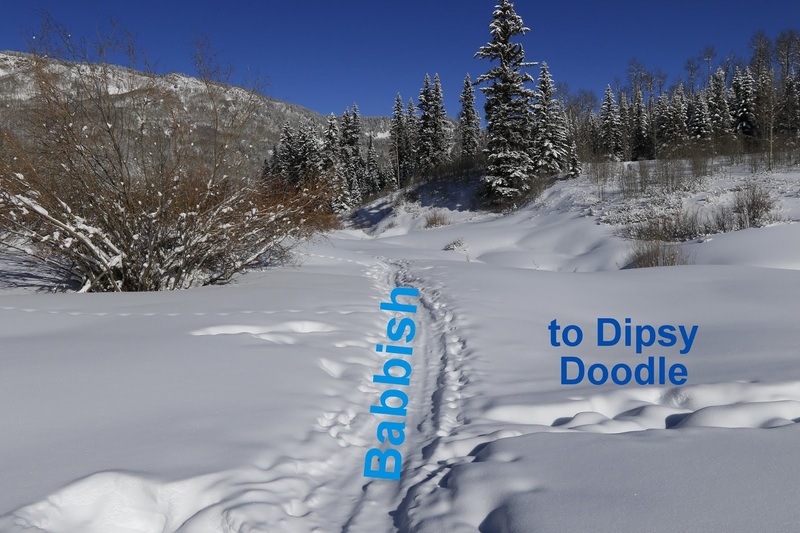 Any trails that lead up that way are probably headed to Dipsy Doodle. The meadows give way to a forest of aspen and conifers as the gulch becomes more confined. About 500 feet or so before the Babbish trail comes to an end the Glades trail branches off on the right. At present that trail is unmarked but the wide path it follows as it crosses the stream and climbs up the east side of the gulch makes it easy to spot. The Babbish trail meets up with the Old Four Mile Road across from the Sunlight Cross Country Ski cabin and comes to an end. From here it is about 1 mile to the right to the Base trailhead and just over a quarter mile to the left to the Upper trailhead. Directly across the road there is a porta-potty and behind the cabin is where the upper end of the Sunshine trail comes out. 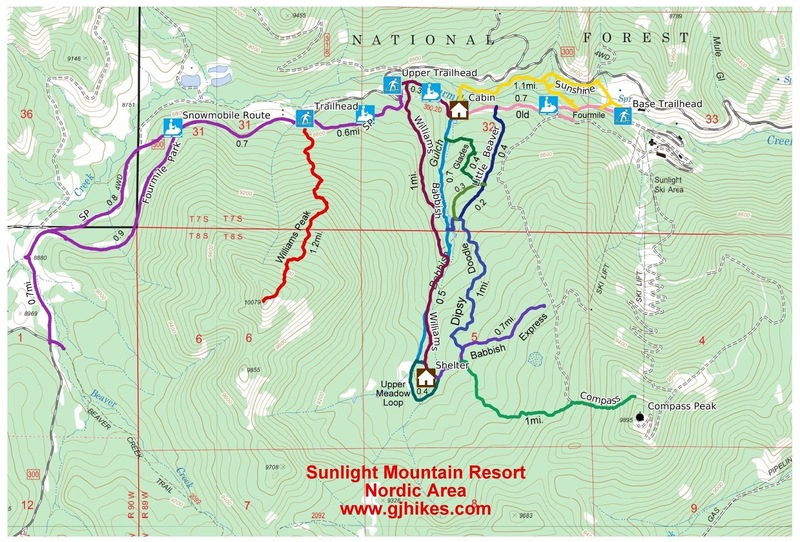 All of these trails present multiple loop options. 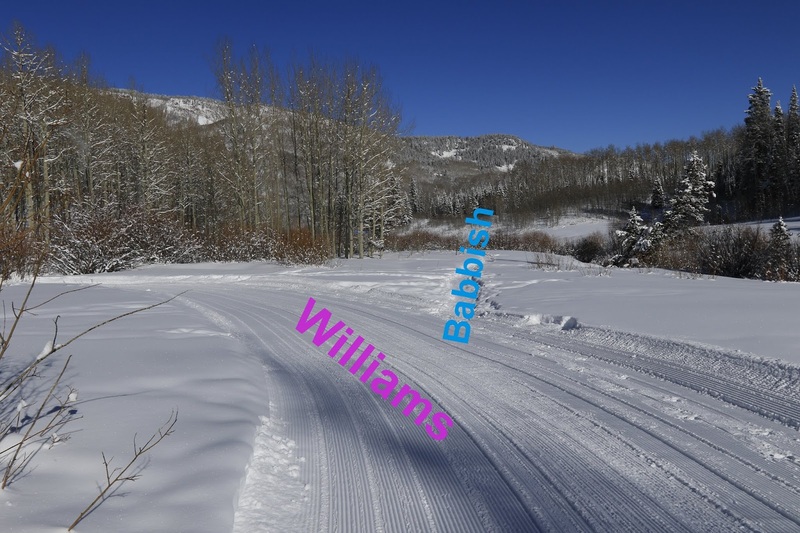 The Babbish trail can be combined with the Williams trail for a nice 2 mile loop that begins at the Upper trailhead. If you would like to see it for yourself then all you have to do is 'Take a hike'.